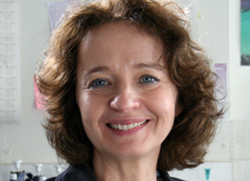 Prof Marina Cavazana began working with biotherapies in 1990 together with Profs Alain Fischer and Salima Hacein-Bey-Abina (Necker Hospital – Imagine Institute, Paris). Their first big success with gene therapy was announced in the year 2000 after 2 infants with an X-linked form of SCID (Severe Combined Immunodeficiency) were cured after having gene therapy procedures. In October 2014, as part of a phase I/II clinical trial, a team led by Prof Marina Cavazzana (Necker Hospital – Imagine Institute, Paris), performed gene therapy on a 13-year-old patient with severe sickle cell anaemia. Conducted in collaboration with Prof. Philippe Leboulch (CEA/ Faculties of Medicine at Paris-Sud and Harvard Universities), who developed the vector used, and supervised the preclinical studies, this innovative treatment provided complete remission of the clinical signs of the disease, and the correction of biological marks. The results, based on a 15-month follow up after transplantation, are published in the New England Journal of Medicine from March 2, 2017, and confirm the efficacy of this new therapy.